How to get list of defined shortcut keys in the Start menu? Is there a way to print / access all the custom keyboard shortcuts I've set up for my programs in Windows XP? I mean the "Ctr + Alt + [LETER]" shortcuts you set up to open specific programs. I've googled but no luck. Supported Platforms: Windows 95, Windows 98, Windows Me, Windows NT 4.0, Windows 2000, Windows XP, Windows Server 2003. ActiveHotkeys is a lightweight computer software program that can display all active hotkeys of a computer system. It does so by testing all possible combinations. The main interface offers two selectors on the left side. The first is called modifiers and is a selection of Alt, Windows, Ctrl and Shift combinations that can be selected. It is possible to test all combinations or only selected ones. Selecting only the Windows modifier will only check the selected keys in combination with the Windows key but not Alt, Ctrl or Shift. The second group are key groups. This ranges from alphabetical over numbers to functional keys and punctuation. It is again possible to select some or all of these key groups. A user selecting all modifiers and all key groups would test all possible Windows hotkey combinations on his computer system. A right click on one of the two selection groups displays quick selection possibilities, e.g. checking all items, or only two-key modifiers. The program will then test the selected combinations and display all results in the main window. Please note that Windows does not allow for detecting which application has registered a particular shortcut, so that feature is not included. While you can't detect which hotkey is assigned to which application, you can find out whether a hotkey is available or or not. Ideal if you want to assign new global hotkeys but want to make sure that these do not interfere with already existing ones. 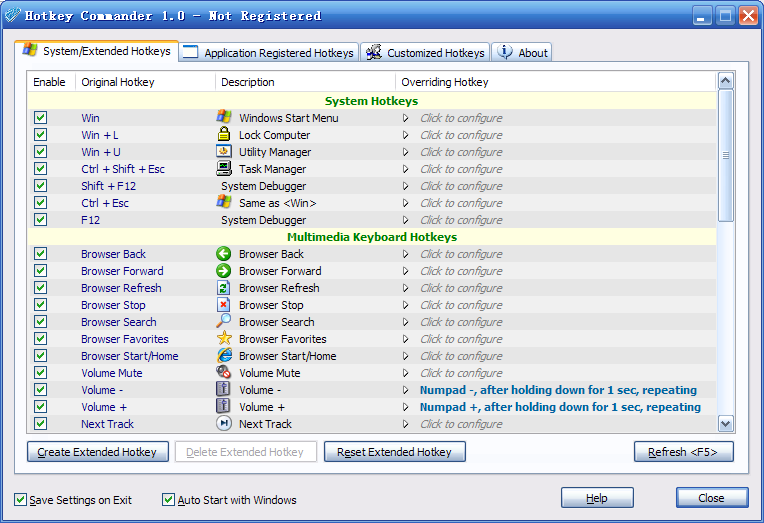 Active Hotkeys is free & portable software. Amongst many other features, it allows you to find out what hotkey combination is registerd by which application. Not the answer you're looking for? Browse other questions tagged windows-xp keyboard-shortcuts or ask your own question. How do I get the list of defined shortcut keys in the Start menu? Custom one-key keyboard shortcuts in Outlook 2010 or 2013? How to configure custom keyboard shortcuts in ElementaryOS Freya?